Hold it right there! I'm Rocket and I'm 16lbs of RAT-TI-TUDE. 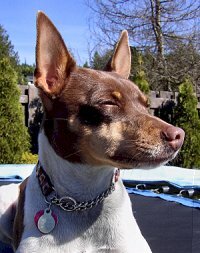 I used to go by the name Rockets Red Glare, but after my humans rescued me from Memphis, Tennessee in March 2001, they felt that "The Pocket Rocket" had more Canadian flair. I'm also known as Rocketman. I suppose the name is fitting - did you know that furniture makes excellent launching pads? 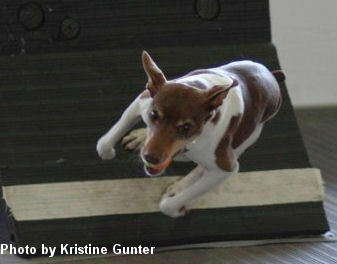 Brian and Joanne sought me out when our flyball team needed another height dog. I was about a year old when I moved to Victoria, and after only four months of training, I started competing with the Division 1 team in July 2001. I started out running for Brian, then his daughter Shawna, but I put up such a fuss that Shawna has basically given me back to Brian. Haha, a terrier always gets his own way! As the only height dog on our Division 1 team for most of my career, I accumulated tournament experience and points quickly; I'm currently the number one ranked Rat Terrier in NAFA. My average time is 4.4 seconds, and my best time is 4.2, so I can hold my own against the big guys. It's my job to make sure all the new dogs know their place on the team - below me! Being a typical terrier, I have a hard time sitting still. When I'm not at flyball, I like to practice agility, take my humans out hiking, or just play with whomever I can sucker in. My favourite toys are those noisy talking type, and my favourite trick is to jump up into your arms. If I do feel like resting for a bit, the prime spot is the back of the couch where I can still survey my domain - but if I hear someone come home, I'm right there at the front door, ready to go again!